Nestle has already lost a legal bid in Britain to trademark the Kit Kat shape. 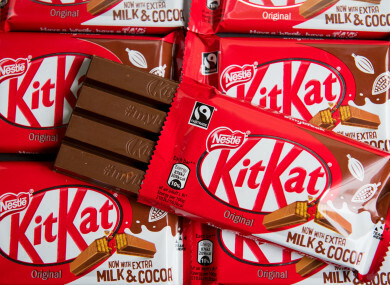 KIT KAT HAS been told it doesn’t legally own the shape of its famous chocolate bar. Nestle has been in a decade-long battle with Cadbury to claim exclusive rights over the four-fingered wafer biscuit which was first sold in 1935. But today the European Court of Justice told the confectionary giant that it can’t own the design of Kit Kat’s four-fingers and found that a previous court had been right to annul the decision by Europe’s trademark group. The EU’s intellectual property office allowed Nestle in 2006 to trademark what the court calls the “three-dimensional shape of the ‘Kit Kat 4 fingers’ product”. But today the ECJ told intellectual property officials to reconsider whether its shape can still be considered an EU trademark. This trademark has helped keep copycat candy-bars out of grocery stores, and punished the development of similar treats owned by Mondelez, including the Norwegian favourite Kvikk Lunsj. The EU’s intellectual property office must now go back to the drawing board and revisit its 2006 to decision to grant Kit Kat an EU trade mark based on its shape. The Norwegian bar Kvikk Lunsj has been made since 1937. Its makers Mondelez also own Cadbury, Milka, Oreo, and Toblerone – and Cadbury took issue with Nestlé’s trademark. A court source told AFP, “Today no one has won, no one has lost. Nestle has saved time because its brand remains registered for the time being. The EU’s intellectual property office “must reconsider whether the three-dimensional shape of a ’4 Finger KitKat’ can be retained as an EU trade mark,” a court statement said. At issue is that the food giant specifically failed to provide evidence that the Kit Kat shape was well enough known in Belgium, Ireland, Greece and Portugal. The trade mark criteria “must be shown throughout the EU,” it said. Email “Kit Kat told it doesn't legally own shape of four-fingered chocolate bar”. Feedback on “Kit Kat told it doesn't legally own shape of four-fingered chocolate bar”.